It is used to obtain a solvent from solution. when the solution of salt in water is heated, the water boils and escapes as steam,leaving the salt behind as a solids. the water is volatile -it has a relatively low boiling point and easily changes to the gaseous sate. Fractional distillation differs from distillation only in that it separates a mixture into a number of different parts, called fractions. A tall column is fitted above the mixture, with several condensers coming off at different heights. The column is hot at the bottom and cool at the top. Substances with high boiling points condense at the bottom and substances with low boiling points condense at the top. Like distillation, fractional distillation works because the different substances in the mixture have different boiling points. distillation is good for cleaning water. it separates from the boiling points. it purify's by taking each chemical out by its boiling point. the main fractions include refinery gases, gasoline (petrol), naphtha, kerosene, diesel oil, fuel oil, and a residue that contains bitumen. These fractions are mainly used as fuels, although they do have other uses too. 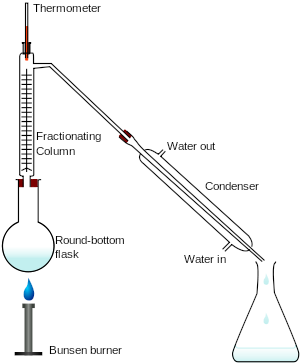 1) simple distillation is used to separate water from a dissolved salts. 2) fractional distillation is used to separate more volatile liquids from less volatile liquids. 3) purification of a mixture often involves a combination of methods.